Mercedes has announced official pricing for its updated SL roadster, with the entry-level SL400 costing from £73,805 and range-topping Mercedes-AMG SL 65 priced from £173,295. Orders are currently being taken with first customer deliveries expected later in the year. As with any mid-life update, the brand’s applied various aesthetic and performance updates to its two-seater drop-top. Look closely and you’ll notice the usual Mercedes grille has been turned on its head – with the new diamond look now wider at the bottom rather than the top. It echoes the 300 SL, which won1952’s Carrera Panamericana road race in Mexico, and sits between new S-Class-inspired LED headlamps. The lower bumper has been redesigned, too, with the daytime running lights moved up to the headlamps. This leaves more space for intricate lower vents and a smaller central air intake. The bonnet is tweaked, removing the two central creases for a smoother design. At the rear you’ll find a set of new one-piece tail-lights, while AMG models get fins in the bumper. There are two new paint colours – Brilliant Blue and Designo Selenite Grey Magno – as well as a range of new alloy wheel options Inside, you’ll discover selectable ambient lighting and a sportier instrument cluster. The analogue clock on top of the dash is an optional extra, as are the range of coloured leather and trim finishes. Under the skin, buyers get the same choice of six, eight and 12-cylinder petrol engines. However, the entry-level SL 400 has been boosted by 35bhp to 362bhp, which knocks three-tenths-of-a-second off the car’s 0-62mph sprint time (now 4.9 seconds). There’s a new nine-speed automatic gearbox, too; this comes fitted as standard on the SL 400 and SL 500. 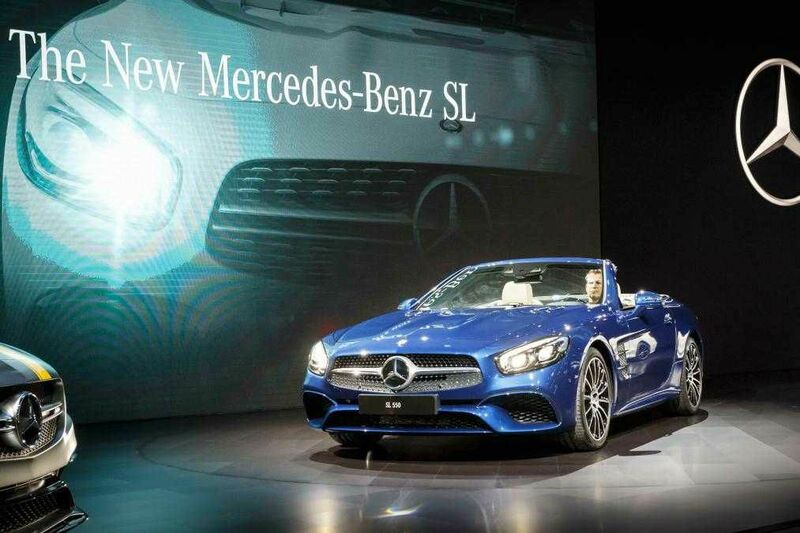 As before, the AMG SL 63 and SL 65 feature a seven-speed auto. Continuously variable dampers are included, as well as a new, more aggressive Sport+ mode. Active Body Control with curve tilting is optional, reducing roll when cornering. As standard, the new SL gets auto emergency braking, while the Driving Assistance Package, which includes active steering and cruise control, is optional. Mercedes claims to have improved comfort and convenience, too. The folding hard-top can be raised and lowered at speeds of up to 25mph, and angled by up to 25 degrees when stowed for improved access to the load area. There’s also a new automatic boot separator, which moves up or down hands-free for increased capacity when the roof is lowered. Other optional kit includes the magic sky Control roof, which can change from dark to transparent, as well as a smartphone Integration package that includes Apple CarPlay. There’s also a Harman Kardon Logic 7 11-speaker surround-sound system. What do you think of the new design? Let us know below!